Infradox lets you create any number of pricing agreements which you can then link to user and/or organisation accounts. Multiple agreements can be linked to accounts. 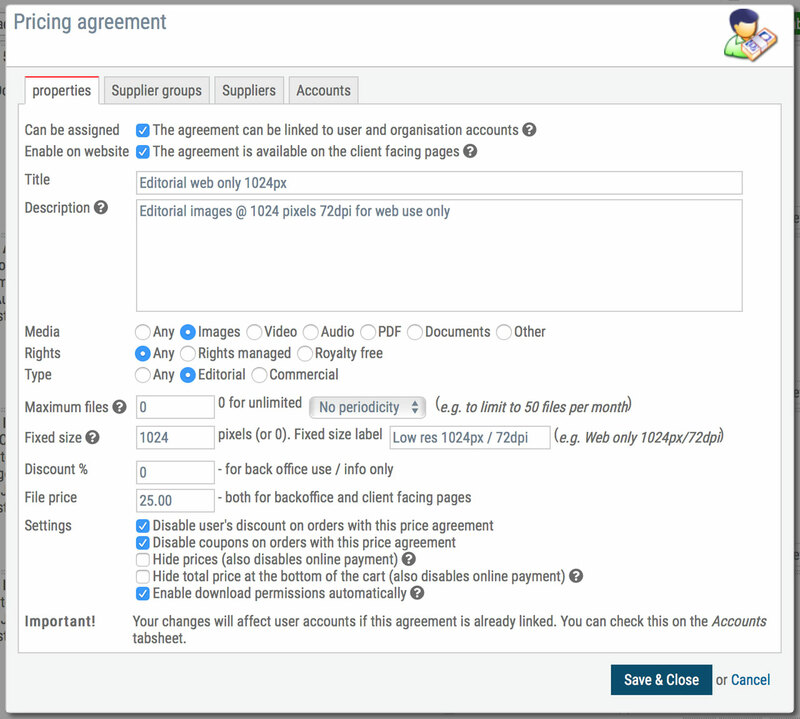 You can use the pricing agreements just for your own information (pricing agreements will appear on order pages in backoffice), but you can also make price agreements available on the client facing pages. I.e. if there are pricing agreements that a user can apply when ordering a file, these will appear on preview pages and the cart page. Users will however still be able to order files without making use of any of the agreements available to them (unless you don’t want this). Pricing agreements can be configured to limit what an agreement can be used for, e.g. you can exclude certain suppliers, you can make an agreement valid for a certain period only, for images only, for royalty free only, for files of a fixed size only and so on. And you can also limit the number of downloads – either indefinitely or in a month. This way you can configure agreements to be used for subscriptions. To view and edit pricing agreements, go to User management and click on the Pricing agreements button in the toolbar. This will open a dialog showing all the previously created agreements. To add a new agreement, click Add agreement at the top. The properties dialog as in the screen shot below will display. If this setting is enabled, the agreement can be linked to user and organisation accounts. If you create an agreement for use by staff members only, then leave this unchecked. To make it available to users on the client facing pages, check this setting. Enter a short title that makes clear what this agreement entails. Enter a complete description of what the agreement entails. On client facing pages only the title appears and when the user hovers over the help icon, the full description appears. If the agreement is limited (see below) to certain types of content or suppliers, then make this clear in the description. Select the content types/media for which the agreement can be used. You can limit the agreement so that it can be used for Rights managed or Royalty free files only. You can limit the agreement so that it can be used for Editorial or Commercial files only. Agreements can be configured to be used for a maximum number of files only. Either indefinitely or within a month. Note that when you link an agreement to an account, you can specify the start and end date. So if you are creating an agreement for e.g. a subscription that lets a user download 50 files per month for a year, then enter 50 in the maximum files input box and select per month in the dropdown box next to it. Enter 0 to leave the normal download function unchanged (i.e. the user can choose a file size on the download page) or enter a number of pixels for a fixed file size. The file will always be the specified size regardless of the pixel sizes etc that you have configured via File collections. If the agreement is configured for a fixed size (above) then the normal file information (configured via File collections) won’t display, the text that you enter will display instead. Note that his option can be used with Images only. If you are configuring an agreement for staff member use only (i.e. users won’t see it or be able to select it) then you can configure a discount percentage. Enter a price in your own currency. These prices will be visible to the user if the setting Hide prices (at the bottom of the dialog) is not checked. If the agreement is available to end users then prices should be made visible – unless the agreement is used for a pre paid subscription. With this setting checked, the normal discount that may have been configured on the user’s account will not be applied on orders that have one or more files with this agreement applied. With this setting checked the user won’t be able to apply a coupon code (for extra discount) to orders that have one or more files with this agreement. If you don’t want to show the price on the client facing pages, then check this setting. This can be used if the agreement is created for a subscription. With this setting checked, the total price will not show at the bottom of the cart page. Again, this is for agreements that are created for subscriptions. Check this setting if the user is allowed to download the files immediately – even if his/her account does not have immediate download permissions. Note that an agreement will not appear on the client facing pages unless it can be applied to a file. I.e. the properties that you configure determine whether an agreement can be used for a certain file or not. So for example, agreements for RF files only can not be used for RM files. You can limit agreements to files that are not from certain suppliers, or that are from specific suppliers only. And the same is true for supplier groups. Click on the Suppliers tab and enter part of a supplier name in the input box and press enter. A list of matching names will appear in the list. You can click on the names to add them to the box. When you’re done adding the suppliers, click close to hide the list. You’ll finally need to select either the “Excluded” or “Included” radio button. If Included is selected, then the agreement can be used for files from the specified suppliers only. If Excluded is selected, then the agreement can be used for all files except the files from the files of the selected suppliers. You can also include or exclude entire supplier groups. This works the same as described above. You can link agreements to both user accounts and organisation accounts. The agreements available to a user are the agreements linked to his/her organisation and those linked to the user’s account. Find the user account (or organisation account) and open its properties. Click on the Prices tab. All the agreements that you have created are listed in the box on the right. The box on the left shows the agreements that are linked to the account (see below screen shot). To link an agreement, drag it from the box on the right to the box on the left. To remove it drag it from the left to the right. If you have created many agreements you can type a few letters in the Filter input box. This will help you find the agreement that you’re looking for (agreements that do not have what you entered in the title are hidden). The agreements that are in the box on the left show an edit link. Click this link to change the start and end date. Without an end date the agreement can be used indefinitely. The User management overview page has a new filter that lets you list user accounts with one or more pricing agreements only. There’s an orange indication in the user overview for accounts that have agreements. The Order management overview page clearly indicates that there are files to which price agreements are applied. The admin Order page shows how many agreements the user has. You can click on the button to show the agreement details. The following paragraphs are about technical implementation of the price agreements functionality if you want to make price agreements available on the client facing pages (you can also use price agreements for your own information only). Go to Site configuration > Preview pages > Buttons – and tick the setting Hide Quote, Pricing and Download buttons if there are pricing agreements. Go to Site configuration > Cart page > Cart page settings – and enable the price agreements. To list the user’s price agreements on his/her account page, go to Site configuration, Website forms and open the section My account form. At the bottom of this section, check the Price agreements setting. Scroll down and click Save. 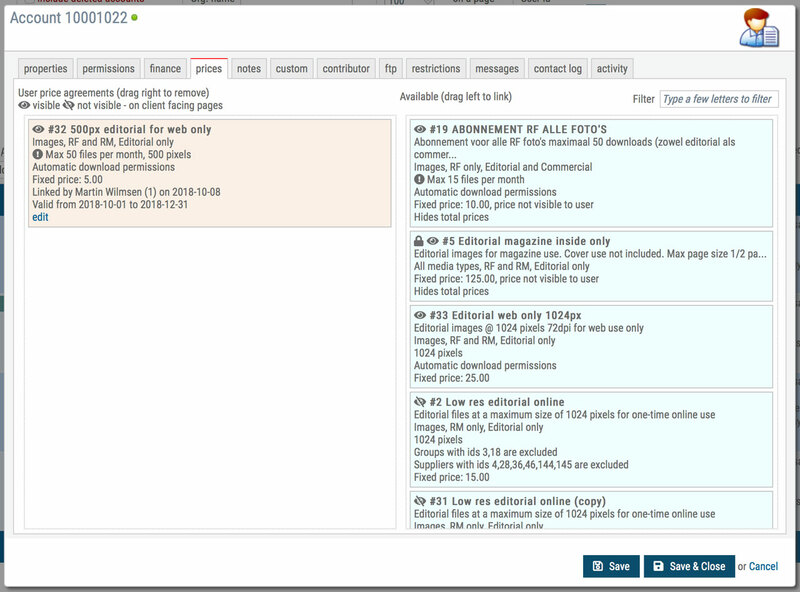 Users can now see their price agreements and how many files they have ordered. If a price agreement limits the number of files one can download, it will also show how many files can still be ordered. Note that an overview of the user’s agreements are also visible on the cart page. There’s a button for it at the top of the cart page. You can find ready to use examples for each of the above templates in the code editor. To let the user add a file to the cart from the preview pages with a selected pricing agreement, you will need to add the beforepreview method to the client object, or if it already exists then you’ll just have to add the script to it. Below is the example script that you can find in the code editor examples . It lets the user select a pricing agreement or other use (in case the user doesn’t want to apply one of the available agreements), and to add a file to the cart with that selection applied. The name of the file with the code for our example is before-preview-method-priceagreements-radio.txt.